Eva received Dirty Bertie: Frights and Bites from Stripes publishing this week which is 3 books in 1. Created and illustrated by David Roberts and written by Alan MacDonald this book is aimed 5-8 years. Paperback copies are available from Amazon for £8.99. Frights and Bites are 3 wickedly funny books in one volume includes Dirty Bertie: Fangs! Scream! & Zombie! Each book has 3 short stories about Dirty Bertie. Dirty Bertie is a boy with nose-pickingly disgusting habits! Full of madcap plans and crazy ideas, Bertie’s always up to his neck in trouble! A perfect book released just in time for Halloween. Eva really enjoyed this book, especially as it is 3 in 1. In the first book, Fangs, Bertie has a world book day at school. He dresses up as Count Dracula but so does the school caretaker, Mr Grouch. Bertie and his friends decide Mr Grouch must be a real vampire because he’s scary. They end up causing trouble trying to trap the caretaker. The second part Fangs! is called Hairy! Bertie’s mum and dad insist he gets a haircut by Sweeney Bob! Bertie really doesn’t want to go, Sweeney Bob doesn’t have lollipops and he cuts all hair the same. He comes up with a plan to get out of having his hair cut.. but it isn’t a great idea at all! Bertie looks ridiculous afterwards. The Final part of Fangs is Fashion! Bertie gets dragged out shopping with his mum and ends up getting lost. In a bit of confusion, Bertie ends up in a fashion show and needs to find a way to escape! In the second book, Scream! Bertie wants to go trick or treating with his friends for Halloween but his parents say no. Instead, he is left with his Gran babysitting him and has to invite his friends in. They come up with a spooky plan to try and get trick or treaters to bring sweets to them instead! Weekend! Is the second part of Scream! Bertie has to go on holiday to a boring cottage. On the way, they get stuck in traffic and Bertie ends up making himself sick in the car eating too many snacks. The country is quite scary and Bertie struggles to sleep and so does Suzy his sister. Eventually, they all sleep in their parent’s bed but when they get up Bertie is in trouble again! The third part of Scream! is Spell! Bertie has a spelling test but he cheats and ends up being entered into the spelling bee. Bertie panics and tries to find a way to get through it with his friend, Eugene’s help. The final book, Zombie! is about Bertie having his friends over for a sleepover at the weekend. Darren & Bertie convince Eugene a blood orange is full of real blood and turns you into a zombie! When everyone falls asleep, Eugene gets up and acts like a Zombie, eating a big bite of Berties mum’s special chocolate cake. No one believes Bertie though, so on the second night, he wakes Darren and his mum to show them. Zumba! Is about Bertie going to watch his sisters dance class. He ends up having to join in but kicks one of the girls so he takes his mum’s phone and sits outside playing a game. When he gets bored he looks in the other rooms and discovers something funny. He calls Darren to come to meet him to take a picture and gets himself in trouble, again! Zoo! is the final story in Zombie! Bertie goes on a school trip to the Zoo and ends up trying to get his roll back from the monkey enclosure after he tucks into lunch early. He tries to get it through the bars of the enclosure but gets his head stuck! These 3 books and their 3 short stories were really fun to read. I think Bertie is funny and like most boys at school. I’d definitely read more of the Dirty Bertie series as they are fun and quick to read. 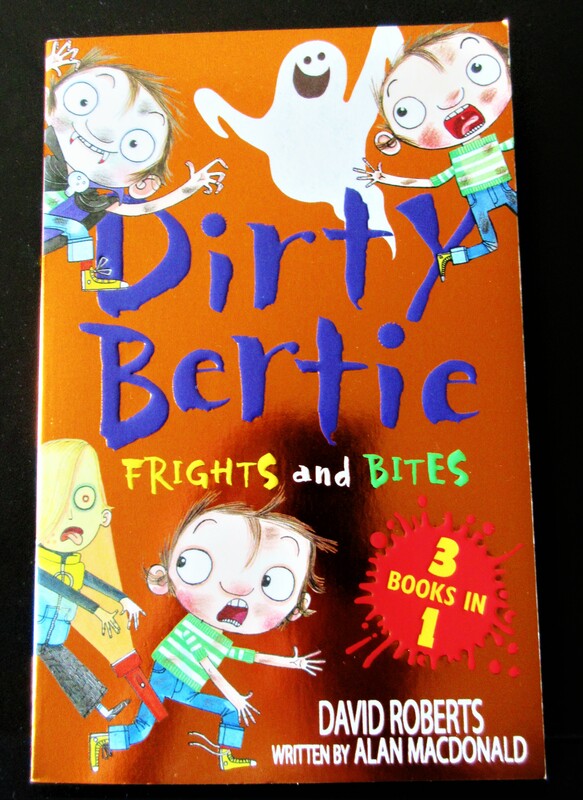 Have you heard of the Dirty Bertie series before?